There’s nothing like a bug infestation to make your home feel dirty and inhospitable. One of the worst residents that will try to crawl into your home is the cockroach. These resistant bugs aren’t just hard to kill, they are believed to be the only creatures on earth that would survive a nuclear blast (1). Starving them doesn’t help much either, as the critters can go months without food. Roaches also tend to live in packs. They leave trace markers in their droppings and near food sources for other roaches to follow. This mean that if you see one cockroach in your home, they are probably more hiding in the darkness or following the trail to your home. Worst of all, these bugs are nocturnal, meaning that they can occupy your home for months before you even notice them. These pesky bugs love the warmth and humidity of a cozy home, which also guarantees them access to the crumbs lining your pantry and baseboards (2). Since their little legs often crawl through sewers and garbage before moving in, roaches often carry and spread coliform, salmonella, staphylococcus, and streptococcus. That’s why preparing food in a roach-infested kitchen often leads to food poisoning. Their droppings are also known to cause adverse reactions in asthmatics (3). Contrary to popular belief, roaches don’t just live in dirty houses, they also thrive in the garbage cans of clean homes. Since the pests can survive just about anything, most roach-killing products are incredibly harmful to your family and pets. But there is a simple trick that will give you the upper hand: roaches have a strong sense of smell. This makes them sensitive to the smell of bay leaves. 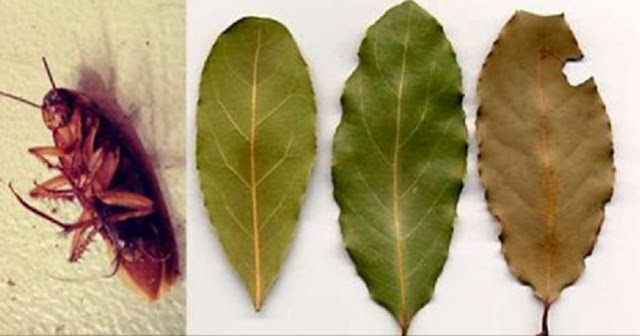 To use, place laurel branches around your home or use the powdered herb in your pantry and garden. Your home will have a lovely smell and your pets and children won’t be harmed! To avoid cockroaches, change your cleaning routine and they’ll walk right out. You’ll need to keep it up for a few months, preferably during the warmer months, before they pack up and leave. Clean up spills immediately and wash out all cans and bottles before recycling. Feed your pet at specific hours instead of leaving out their food all day and night and keep their water dish in a well-lit room. Store food in plastic and glass containers. Roaches can chew cardboard and paper, so transfer all pantry-stored goods in sturdier receptacles. Clean dark and damp areas in your kitchen, like behind the fridge or under the oven. Store garbage in sealed plastic containers and dispose of them daily. If possible, keep your closed garbage can outside. Wash your dishes after every meal or soak in hot water and dish soap. Vacuum your floors and furniture often, as they’re hotspots for egg masses. Dehumidify your garage and bathrooms and fix any leaky or poorly insulated pipes. If cockroaches are a chronic problem in your household, call an exterminator to find out where they’re coming in whether it be a crack in a wall or a broken screen, and block their entry point immediately. You can also line your doors, windows and baseboard with non-toxic Diatomaceous earth to kill these unwelcomed guests. Just make sure that you and your pets don’t inhale the mixture. You can also make your own roach trap by lining a small jar with petroleum jelly and covering it with masking tape on the outside. Place a bit of food inside and place it in a cool, dark place. Cockroaches should be able to crawl in, but they’ll get stuck once inside. Once caught, you can release them far away from your home or kill them by sealing the jar and freezing it for two days or filling the jar with soapy water and sealing it for a few days. This post was republished from dailyhealthpost.com. You can find the original post here.